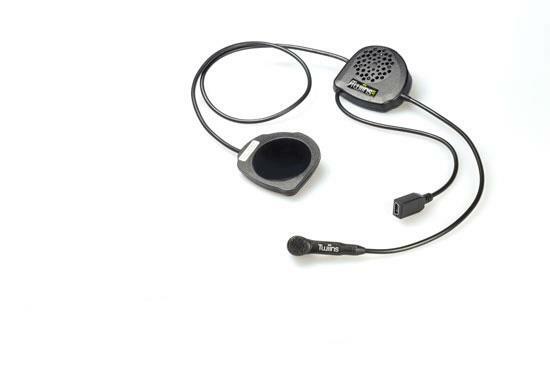 The Twiins FF2 (£79.99) is a bluetooth-powered communication system made specifically for full face helmets. It allows riders to connect to their mobile phone in order to take calls, listen to music or hear directions. There's also a voice command system built in so you don't have to use your hands. All the electronics are housed in one of the speakers, which means there's no need for a bulky unit stuck to the side of your helmet. The USB-rechargeable polymer lithium battery has a stand by time of 200 hours, with seven hours of talk time. Unfortunately that's all you can do with the FF2 as it comes out of the box. If you want to use it as an intercom you’ll need to buy the D3 kit for an extra £51.99. If you do opt for the D3 kit, the system is able to stay connected to both devices at once, so you can get directions and talk to your mate.